When King Salman bin Abdulaziz al-Saud landed in Japan, people were left in awe of the size of his delegation and his 500 tons (metric) of luggage. The king made quite an entrance, descending from his plane on one of his two golden escalators. The four-day visit, which began Sunday, is part of the Saudi royal’s month-long Asia trip, as the kingdom looks to diversify its economy from oil dependency. Saudi Arabia is Japan’s largest oil supplier. The king’s delegation arrived in Japan on 10 aircraft and, according to Japanese media, the entourage is so large, even Japanese government officials didn’t have an accurate number of how many to expect. In preparation for the royal visit, 1,200 rooms in Tokyo’s best hotels were booked for the delegation. King Salman appears to have upped his game since visiting Indonesia, where he brought two limousines with him. In Japan, an entire fleet of up to 500 limousines were sourced from around the country. "Maintenance costs for luxury models are high and there is little constant demand for such vehicles," a limousine industry insider told Asahi Shimbun. "Because we are unable to secure the needed number only in Tokyo, we are gathering the vehicles from Kanagawa and Saitama prefectures as well as the Tokai region." On Monday, King Salman met with Japanese Prime Minister Shinzo Abe. 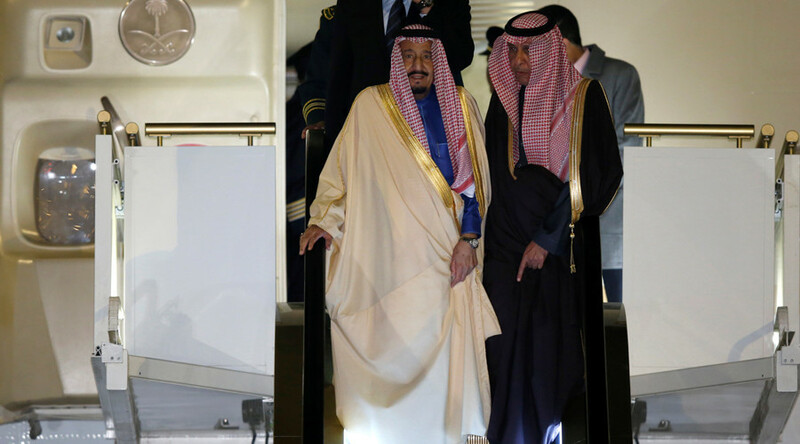 King Salman visited the country as a prince in 2014, but this is the first Saudi Arabian king to visit in 46 years. Salman told Abe that the Middle East is facing diplomatic issues involving the Palestinians, Japan Times reported, and cited humanitarian crises in Yemen and Syria. A Saudi-led coalition has been bombing Yemen for almost two years. “Unfortunately, those crises are now giving negative impacts to the region,” the king said. The Saudi royal’s trip caused many on social media to react in anger, comparing the king’s lavish travel to the situation in war-torn Yemen. King Salman will also visit the Maldives and China during his Asia trip. In the Maldives, the king is expected to be met with opposition following reports that an entire atoll of small islands could be purchased by the Saudis. While the king is courting Asian leaders, his son, Deputy Crown Prince, and Defense Minister Mohammed bin Salman are headed to the US to meet with President Donald Trump.